Many artists spend their lives trying to render three-dimensional reality into a realistic two-dimensional image. Make3D does the opposite: it takes a two-dimensional image and digitally creates a three-dimensional model to give the viewer multiple perspectives of the same image. These 3D models show the depth of the object or scene and allow for the viewer to move around the image. 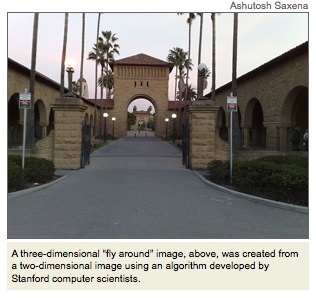 Using an algorithm and an artificial intelligence technique developed by researchers at Stanford University, the original 2D image is broken up into tiny bits and the algorithm predicts the three-dimensional qualities of the image such as depth and scale and then recreates the image in model form using the results of the algorithm. The applications of extracting 3-D models from 2-D images, the researchers say, could range from enhanced pictures for online real estate sites to quickly creating environments for video games and improving the vision and dexterity of mobile robots as they navigate through the spatial world. Viewers can see the algorithm at work by visiting the Make3D website and uploading their own photos. The site allows visitors to rate the model of their image as good or not and to suggest alternatives in order to improve it.